In contrast here in Skaneateles, the window of time when we get to enjoy the summer sun isn't nearly as long as we'd like so sweltering or no, we spend as much time outdoors as possible to soak it up while we can! If I haven't mentioned it before, our little slice of central NY is one of the best-kept secrets. Not only do we have the drop-dead gorgeous natural beauty of Skaneateles Lake (one of the 11 Finger Lakes, just in case your geography is a little rusty); but the village of Skaneateles - which virtually perches right on the lake's shore - is so completely charming. 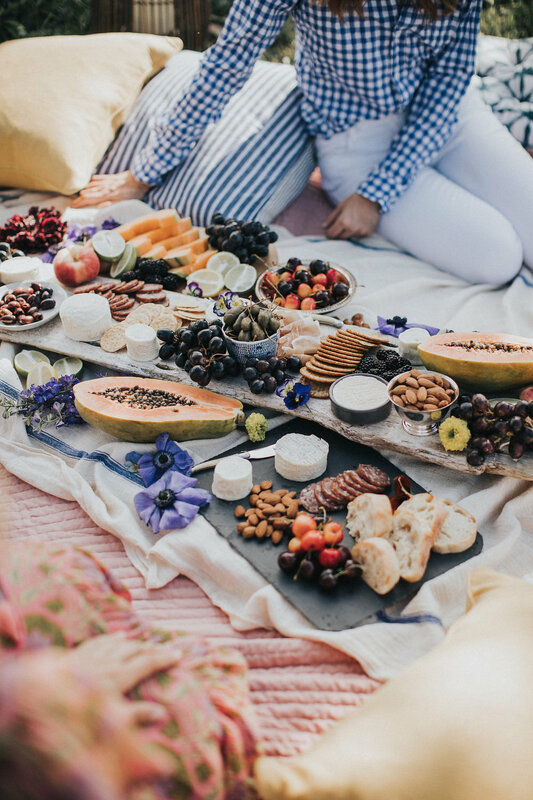 That all said, we heeded the call of the lazy, hazy summertime and hosted a lakeside picnic so we could share the beauty of the area (and a few ideas on how you can bring the indoors outside too) with you. We invited the "dream team" - our friends from our favorite local boutique, Skaneateles 300, (remember the fun fall celebration we hosted together last year?) and Whitney Nichols Photography, along with Lynn Monster Beauty and Graft Journal, as well as some of our favorite clients who graciously volunteered the area behind their beautiful lake home as the perfect backdrop for our little mid-summer picnic - to join in the fun. Who says you need a picnic table?! We spread out blankets and a few cozy pillow puffs, and placed our driftwood charcuterie tray down for all to gather around. Then we topped this cool vintage cot with a custom made linen and down bed roll and a scattering of linen pillows and tucked it under a nearby tree for impromptu catnaps. Can't you just see yourself drifting off into a sweet midsummer slumber there?! Aren't our models' outfits (all from Skaneateles 300, of course) so cute?! I just love the hats! I had such fun putting together the charcuterie tray using my big driftwood platter. Our spread featured a beautiful selection of olives, fruit, and crackers. But the best part of all was definitely the cheese and wine! Many thanks to Vermont Creamery for gifting Teaselwood Design with a large box just brimming with cheeses of every kind, and to Buttonwood Grove Winery for so generously sending Teaselwood a selection of their delicious wines. Cheers to both of these fabulous companies! If you'd like to create a fantastic cheeseboard yourself for your next get-together, Vermont Creamery has a great how-to guide - complete with recommendations on how much cheese to allow for per person - here. And if you don't live in our area, but you'd like to enjoy Buttonwood's wines, you can! Pick a bottle or two, or join their wine club here. I made the blackberry lavender "naked" cake using this recipe from one of my favorite food blogs, Half Baked Harvest (though full disclosure, I omitted the white chocolate in the frosting for a more lightly sweet vanilla version). By the way, we'll be sharing the recipe for this gorgeous tomato and buffalo cheese tart and this Beet Hummus with you soon, so stay tuned! The bread (oh, that yummy bread!) was from Patisserie, a local bakery at Sherwood Inns & Appetites, a Skaneateles village staple. And Graft Journal brought along the fun cherry hand pies and the lemonade. So summer-y! It's truly as simple as that! All it takes is packing up a few items from inside your home and taking them outdoors and you've got yourself one dreamy summer afternoon. And if you happen to be somewhere with no water in sight and soaring temperatures, here's hoping you've cooled off a bit by vicariously experiencing our picnic! Or better yet, maybe you're now booking an impromptu trip to come to the lake yourself!